Skipping gives you a fantastic full body workout and burns as many calories as sprinting, whilst being safer and easier on your joints. It’s quick, easy to learn and so simple, yet totally packed with benefits. Skipping is cheap, portable and anyone can do it. You get a serious workout in minutes, using just your rope! Nothing else required. Short bursts of skipping are a great form of High Intensity Interval training – providing fantastic cardiovascular benefits. The many benefits of HIIT include reduced blood pressure, improved cardiovascular fitness, and reduced tension & stress. Skipping is a weight bearing exercise, so it helps to increase and maintain bone density. This is crucial for all of us because our bone density naturally declines as we age. It is well documented that engaging in regular weight bearing exercise can help to prevent osteoporosis. The NHS includes skipping in it’s list of recommended weight bearing exercises. Regular skipping will improve your coordination, balance, and flexibility. It gives every muscle in your body a workout, improving your muscle tone with each little jump. It’s particularly good for your for your calf muscles, and promotes muscle endurance as you get used to the intensity. The actual jumping movement involved in skipping gives your lymphatic system a nice boost. This important system contains your white blood cells which help you fight off infections. Your lymph system also contains a colourless liquid which is filled with waste products, toxins, bacteria, and damaged or cancerous cells. These drain into the lymph system, which then removes these from our general circulation. The lymph system is therefore a crucial part of our immune system – helping us to fight infections and stay healthy. It works in a similar way to the blood system (our arteries and veins), but it doesn’t have a pump like the heart. The act of jumping or bouncing acts to artificially pump the lymphatic system and is sometimes recommended for sufferers of lymphoma to flush their system and hopefully give them the boost they need. 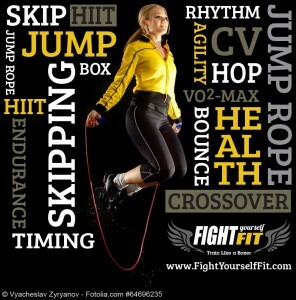 Jumping during skipping strengthens every cell and provides benefits for your organs as you work to defy gravity. This is hard to do, which is why skipping gives you such a good workout! It gets your circulation moving and makes your heart work hard to keep up with the high demands of the task! This ‘aerobic jumping’ as some people call it literally does affect every cell in your body! With such amazing effects we should all be skipping for a few minutes each day, aiming to incorporate this potent exercise into our existing schedules. If you don’t have a rope, get one today – the cheaper ones are fine – no need to spend more than a tenner. If you need any further persuasion, just remember, skipping is fun, quick, you can do it anywhere – indoors, outdoors, in much smaller spaces than you realise. It can make you young again (ok not guaranteed, but you will feel younger and that’s pretty much the same thing). It improves your rhythm, timing and overall fitness in just five minutes a day. What’s stopping you, come on let’s do it. See you in the playground! – lift both feet at the same time as the rope passes underneath. – run on the spot with knees high. – keep your feet together and aim to pass the rope under your feet twice per jump – jump high for this one! – Use one leg for 2-3 jumps, (building up to 10). Swap legs. Return to two leg jumps for the rest of the cycle. Repeat. – Cross your arms in front of you in between jumps. – Jump with both feet together slalom style. Aim for 3 minute rounds eventually with a 30 second rest between rounds. 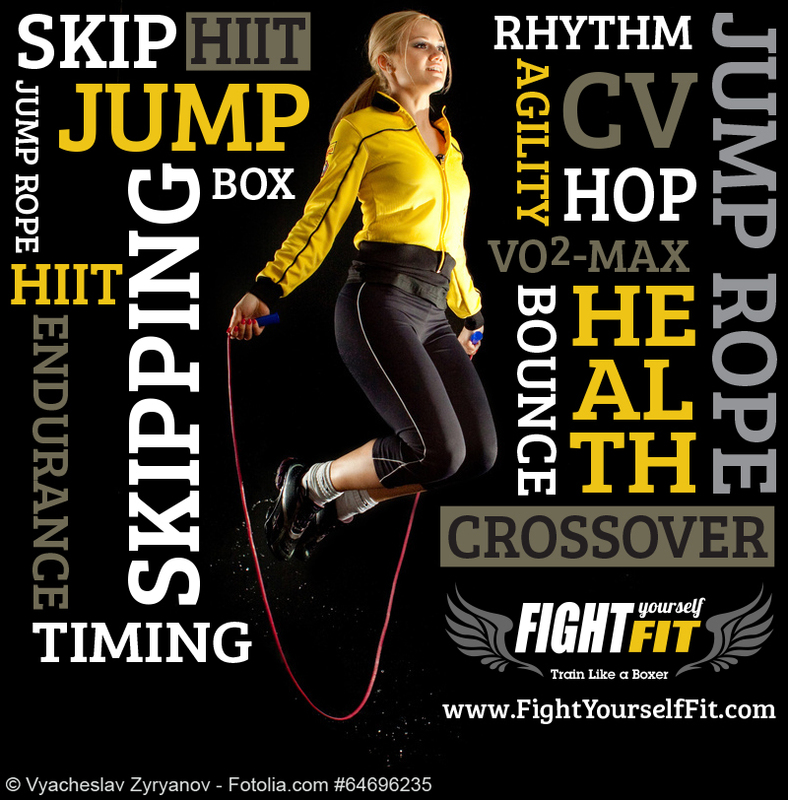 Build up to 9-12 minutes of skipping each day. Add this to your existing workouts and soon you will be skipping like a pro!